I'm back, Sorry folks. I know I'm very late but H A P P Y N E W Y E A R ! ! ! I got back from a holiday last sunday. I had an amazing time, filled with laughter and cheer with my family and friends. I hope you had a gorgeous and relaxing break and 2015 has got off to an awesome start for you. I can't believe we're already halfway into January .. how time flies. 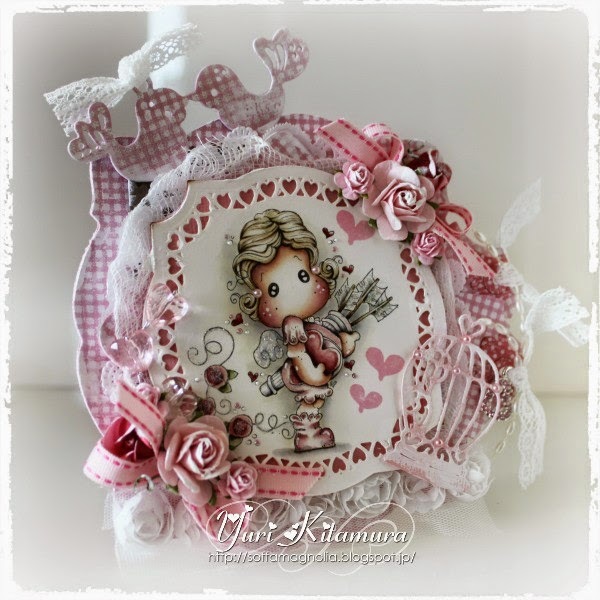 Today I'm kicking off this year's blogging with a card I made for the Ribbon Girl Challenge blog. This time the colour theme is Pink. Here's my card. 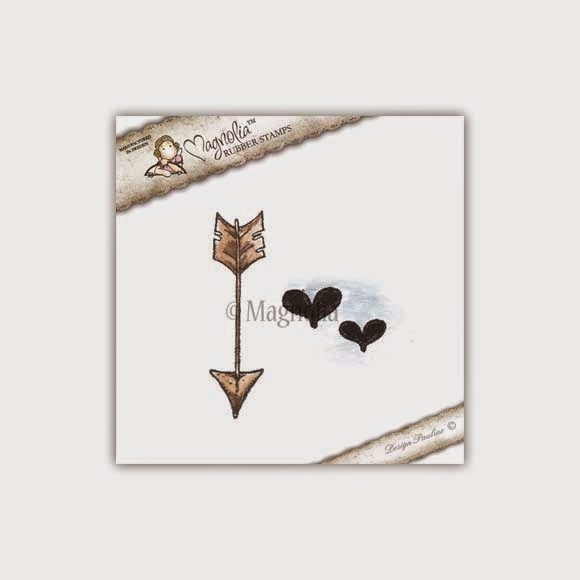 My card features the following brand new stamps from Magnolia's Lovely Duo Collection 2015 - You Are My Valentine Tilda duo, Lovely Hearts And Arrow set and Lovely Ring And Rosecorner set. I almost died of cuteness when I first saw this collection! They are so cute and I absolutely love the images and the sentiments. I've coloured her with Distress ink reinkers and Prismacolor. 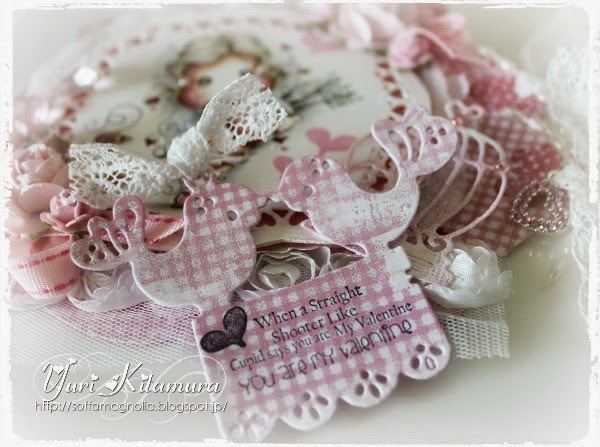 I also used a couple of new dies - Bird tag and Birdcage from Magnolia DooHickey Club #3 Limited Edition Oh La La. 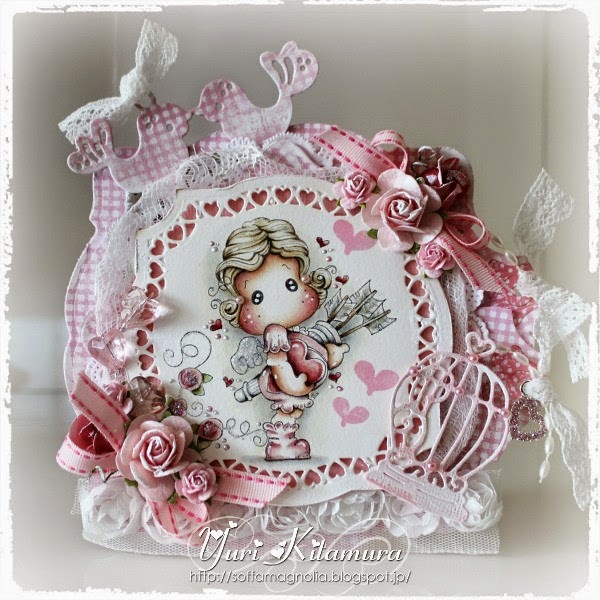 For my tag, I used the bird tag die and stamped on it with the lovely sentiment from You Are My Valentine Tilda duo. Isn't this tag just the cutest? I adore this one so much. I used following lovely embellies: 18mm 'Teresa' Ivory Fine Vintage Style Cluny Lace, Pink Diamante Side Heart Charm, 3mm x 5mm Oval Ivory Pearl String, Rose Organza Pale Ivory, Pale Pink 10mm Open Roses, 9mm Pink/Fuschia Saddlestitch Ribbon, Cheesecloth, 3 Stems Clear Crystal Hearts all from The Ribbon Girl. I love how this card would be perfect for Valentine. Hope you like it. Head on over to the blog for the challenge details and for more inspirations from other gorgeous Ribbon Girls. Okay, that's all from me for today. Thanks for stopping by and have a beautiful Sunday! Such an amazing job! Your card is SO VERY PRETTY! I have been looking through the DT cards on The Ribbon Girl blog (still can't believe I am now a ribbon girl) and wondered if you could tell me where I can buy the die with the hearts around the edge. It is gorgeous as is your card. Beautifully coloured image and beautifully embellished. Hi Sharon. A big warm welcome to the team!! Thank you for your lovely message. 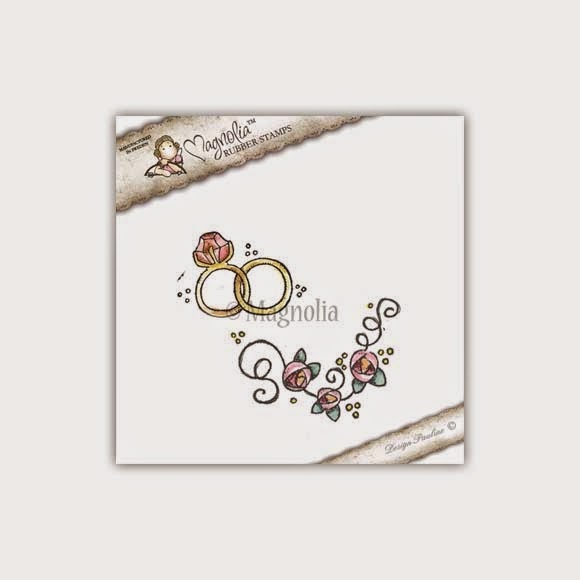 The heart frame was diecut with Spellbinder dies - S4-424 and S4-416. Thank you Roselany for your message. That dies are Spellbinder S4-424 and S4-416. Your card is very beautiful! I love the pink tones and the dies are really nice together. This is absolutely beautiful! I love the pretty colour scheme and gorgeous details - perfect in every way! 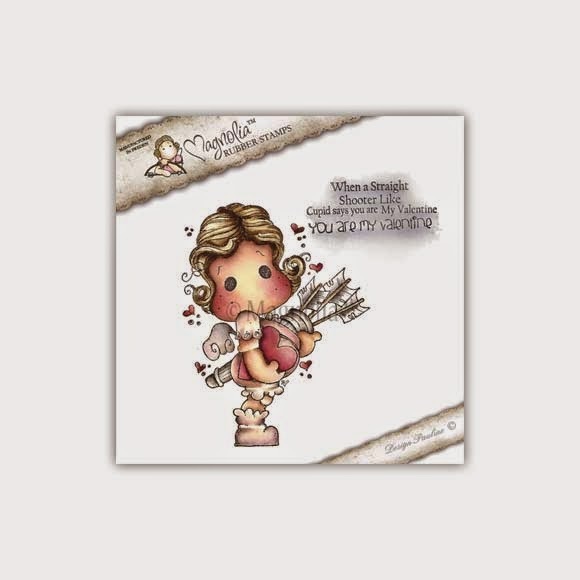 Another awesome card from you! You are so talented!